Nintendo's quirky new Pokémon adventure, Pokémon Quest, features a blocky world filled with equally as blocky iterations of Pokémon’s Generation One favorites. In Pokémon Quest, you’ll set up camp on an island and get right to the task of cooking delicious recipes to lure new Pokémon. Create a party of three Pokémon and take them on Expeditions, where they’ll battle wild Pokémon and find those delicious cooking ingredients. It’s all very charming and may easily bring out your inner Poké Maniac. Of course, it wouldn’t be a Pokémon game without featuring the game’s well-known evolution system, in which Pokémon evolve to more powerful versions upon meeting certain criteria. Pokémon Quest has simplified this procedure from other games—there’s no evolutionary stones or held items. Instead, Pokémon will evolve upon reaching certain levels (with the exception of Eevee, who we’ll go into more detail about below). Here's everything you need to know about evolving your Pokémon in Pokémon Quest! There are two ways to gain experience for your Pokémon in Pokémon Quest: Expeditions and Training. The three Pokémon you have selected to take on Expeditions will gain experience at the end of the Expedition. Successful Expeditions will yield more experience, but there is still a minor gain from those that may have been failed. Training is a bit more destructive, as it allows you to earn experience for a specific Pokémon by (essentially) feeding it other Pokémon. Once a Pokémon has been used for Training it will leave your camp, so be careful of which Pokémon you’re selecting (and keep an eye out for those shiny stars)! Using higher leveled Pokémon as well as Pokémon of the same type as the trainee will award higher experience. Simple enough! When a Pokémon is ready to evolve, it's portrait will take over the Power Charm in the Expedition Results screen and a brief animation will play. Unfortunately, the evolution theme music from mainline Pokémon game is not present Pokémon Quest. 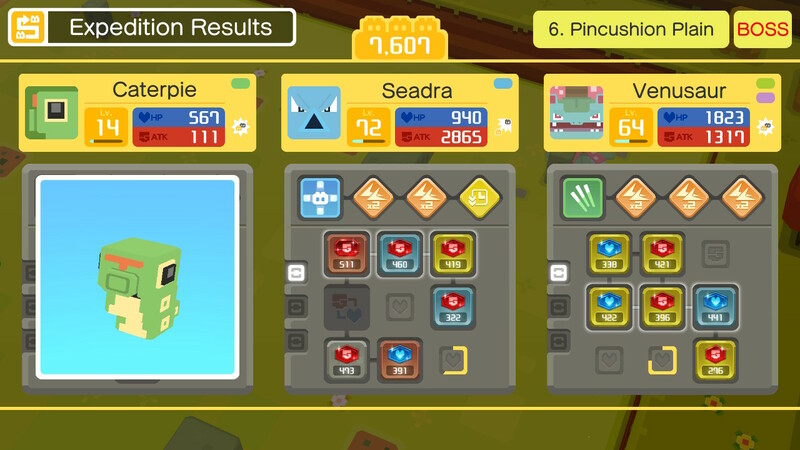 In Pokémon Quest, Pokémon will automatically evolve upon reaching a set level (see the list below). If you wish to keep a Pokémon in its earlier form, there is an option to toggle an Everstone on each Pokémon, which will prevent the Pokémon from evolving until toggled off. You can find the Everstone option by tapping “Edit Team,” selecting a Pokémon, tapping the “Power Charm” button, and toggling with the button initially labeled “OFF” at the top right of the screen. 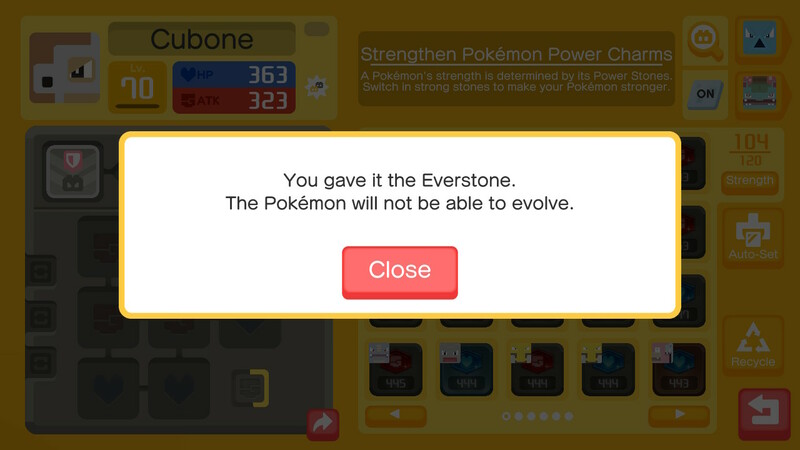 You’ll get a pop-up notification that you have given the Pokémon an Everstone, preventing it from evolving. Simply tap the button again to remove the Everstone. Flareon: Equip more ATK stones than HP stones. Jolteon: Equip an equal number of ATK and HP Power Stones, or no stones at all. 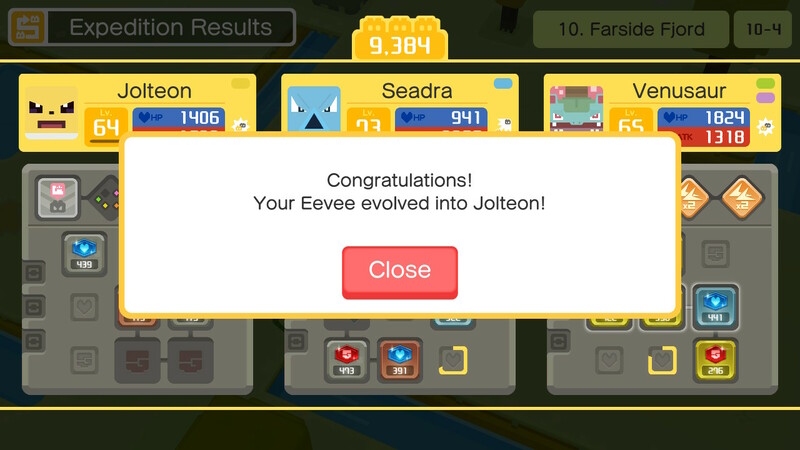 Vaporeon: Equip more HP stones than ATK stones. Eevee will not evolve until it reaches level 36, so you’ll have time to equip the necessary stones. If your Eevee is already level 36, it will evolve upon reaching its next level, so be sure to equip the stones before then to ensure you obtain the Eeveelution you want! Aside from Eevee, every other Pokémon will evolve simply through leveling. If an unevolved Pokémon has already exceeded its set evolution level, it will automatically evolve upon reaching its next level. This means if you come across, say, a level 56 Abra, upon reaching level 57 it will automatically evolve into Kadabra. You’ll then have to reach level 58 to further evolve into Alakazam. As always, you can prevent these evolutions by toggling the Everstone. Here’s a full list of the required evolution levels for all Pokémon currently found in Pokémon Quest. Skilled Poké Maniacs may recognize that many of these evolution levels mirror those found in the original games. Additionally, Pokémon that had alternative evolution conditions (such as requiring a stone) now evolve automatically upon reaching level 36. For ease of use, the below list of Pokémon is organized in alphabetical order, so do note that this list will not match the order of the Pokédex.